Well! It’s been quite some time, but I am settled down from my travels, from my new job, from a few other things that have been keeping me very busy these past few weeks since the start of Jeopardy!’s 32nd season, but I am back now to again resume this thrice-weekly tradition I’ve been doing for… twenty months? Thereabouts? And even better, this return-to-form just happens to be the decimally-significant milestone of installment number fifty! I think, for no particular reason, we’ll take a look at WAR NOVELS from last Friday’s episode, Matt Jackson’s eleventh victory. Quite a player, that one. The gist: That nickname worked until as late as World War I. Before then, British soldiers wore red coats – and were called Redcoat – not because of some old story about hiding bloodstains, but for a long and complicated combination of cultural, historical, and strategic* reasons. 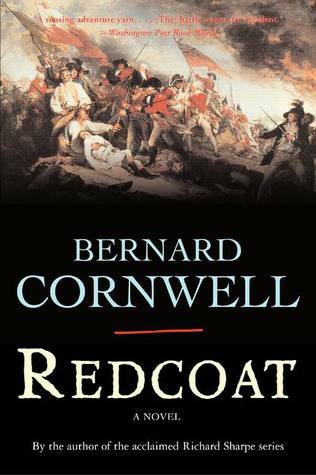 The titular redcoat of Cornwell’s novel is Sam Gilpin, a young soldier from England sent to the Colonies to put down the local insurrection. Having made friends with a young captain who served closely with General Sir William Howe, he and his twin brother find themselves embroiled in the combat, the politics, and the love triangles of occupied Philadelphia. He navigates the complicated relationships between loyalists and rebels, meeting characters who want nothing more than to liberate/control their country and settle down with their girlfriend/their neighbour’s wife/whoever else. The real occupation of Philadelphia, many of the details of which are accurately described (or accurately fictionalized) by Cornwell, occurred between 1777 and 1778. At the time, Philadelphia was the seat of the Second Continental Congress, making it effectively the capital of the newly-declared United States of America. The campaign was the brainchild of General Howe, and was not without its critics. While Howe succeeded in capturing and keeping the city for ten months, it kept a large number of British troops occupied while provoking the French to ally with the rebel cause. As a result, Howe was not able to reinforce the Redcoats at Saratoga, among the greatest British defeats during the Revolutionary War. Meanwhile, Washington’s troops were camped at Valley Forge, some 30 miles outside the city. When Howe resigned his command, his replacement was ordered to abandon Philadelphia and return to the defense of New York in case of a united French-Rebel attack. It was along this northward march that Washington harried the British to the point of forcing the Battle of Monmouth. The clue: Redcoat is certainly not one of the best-known war novels out there, so this clue is less about the book than it is about knowing the longstanding nickname for British soldiers, which certainly anyone who went through the American school system ought to know. An easy stepping stone into the category. In Jeopardy! : Such a popular concept in the American historical psyche ought to be easy pickings for Jeopardy!’s writers, and indeed “redcoat” appears in a healthy 20 clues in the J!Archive (only two of them mention Cornwell). Naturally, all those that don’t use the term in the clue are simply asking for a common nickname for British soldiers. The rest just use it as a stand-in for the “bad guys” of the Revolutionary War, except for a 1997 category called “THE REDCOATS ARE COMING!” Just remember what it’s a nickname for, and keep it in mind for “colourful” clues. * Or more accurately, maybe, non-strategic reasons: while it seems strange today to dress rifle-bearing soldiers in bright colours, for much of the history of rifling, soldiers were more than obscured by the smoke caused by the combustion of black powder.